(Bloomberg) -- Lyft Inc., the No. 2 U.S. ride-hailing giant, jumped in its debut after raising $2.34 billion in an initial public offering that priced at the top of an elevated range, sending an encouraging signal to the stampede of Silicon Valley companies lining up to go public this year. Shares opened Friday morning at $87.24 -- 21 percent above the IPO price of $72 -- and drifted downward in the afternoon, closing up 8.7 percent to $78.29 in New York. That gives the company a market value of about $22.4 billion. After a chilly start to 2019 for U.S. IPOs as the federal government shutdown stymied activity, Lyft’s success could light a fire under a market that’s likely to welcome Uber Technologies Inc., Pinterest Inc. and Slack Technologies Inc. -- to name a few --- before the end of the year. San Francisco-based Lyft sold 32.5 million shares after initially marketing 30.8 million shares at $62 to $68 each. It increased the range to $70 to $72 the day before the IPO was set to price. Shares are trading on the Nasdaq Global Select Market under the ticker LYFT. All eyes were on Lyft Friday morning as investors rushed to get a piece of the first big U.S. technology listing of the year. The stock’s early performance served as a litmus test for public market investors and their appetite for money-losing tech companies. Investors didn’t seem to mind that the company was losing money. Last week, after just two days of marketing to investors, Lyft’s listing was oversubscribed. By Friday, Lyft ended up selling more shares than planned at the top of an already elevated price range. In all, more than two dozen banks were listed in the company’s filing as participating in the offering. JPMorgan served as the stabilizing agent, giving it a chance to earn additional fees by ensuring the first day of trading went smoothly with limited stock price fluctuations. 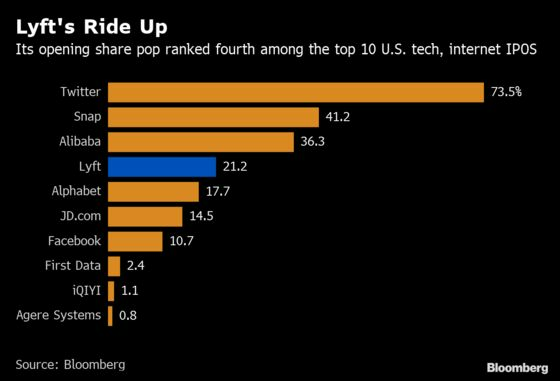 Of the 22 tech and internet companies that have raised $1 billion or more in U.S. IPOs, Lyft ranks seventh at $2.34 billion. That was just behind last year’s $2.42 billion listing by the Chinese video service iQIYI Inc. and ahead of Twitter Inc.’s $2.09 billion offering in 2013. Lyft investors got a 21 percent pop when trading opened over the offer price of $72. That ranked Lyft as the sixth best of that group at the opening price. Its closing price put it more toward the middle of that pack. Attention grabbing tech listings often soar on their first day of trading. Snap Inc. closed its first day of trading up 44 percent in 2017, while Alibaba finished its debut up 38 percent. Snap now trades at less than two-thirds of its listing price while Alibaba has almost tripled its market value. Lyft’s offering fulfilled a key strategic goal for the company: beating larger rival Uber to the market. Uber is expected to publicly file for its offering in April, kicking off a listing that could make the company worth as much as $120 billion, people familiar with the matter have said.